As most of you know most drugstores offer 3 for 2 deals all the time, meaning that everytime I walk into either Boots or Superdrug I always talk myself into buying 2 extra products that I don't need. I thought it would be different and hopefully somewhat interesting to share what I got, so if you face a similar dilemma you can read this post. Instead of just telling you what I got I will also share my first impressions of each product too so you have an idea of whether or not you spend your cash on them. The product I walked in for was the L'Oreal Infallible Total Cover Foundation (£10) in Shade 24 Golden Beige. My local Boots didn't have this shade in stock, which sounds like the closest match to me, so when I visited my friend in Nottingham last weekend I checked the nearest Boots and lo and behold I was in luck. I snapped it up after doing a quick hand swatch and then scoured the shelves for two more products to take advantage of the perpetual 3 for 2 offer. Instantly, I was drawn to the L'Oreal Voluminous Extra Black Mascara (£8.50). This mascara is a cult favourite and I can never find it in store anywhere. I couldn't believe my luck. 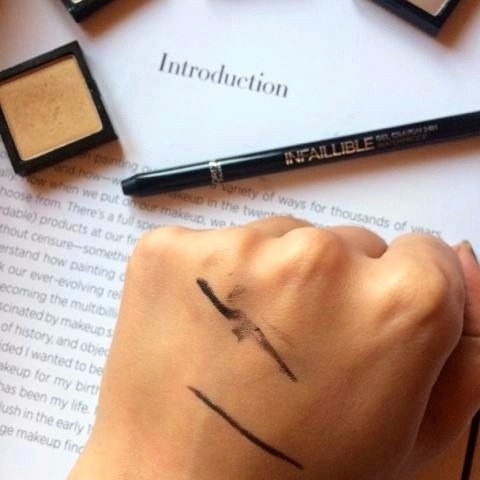 Lastly, I decided to try out the Infallible Gel Eyeliner (£5.19) in Black because Kaushal Beauty mentioned it as being really black, creamy and long-lasting. I have only tried each product once, except for the gel liner which I had swatched on my hand. My first impressions are that the Total Cover foundation is very thick and full coverage. It takes a lot of effort to blend and Golden Beige appears a shade too light for me I think. As of right now, I much prefer the L'Oreal True Match and L'Oreal Infallible Pro Matte foundations to Total Cover. The mascara, on the other hand, is really nice. It's a great separating mascara but doesn't give any volume or curl, I would suggest curling your lashes well first and then applying a few coats of this mascara for a noticeable effect. It's subtle but non-clumping which I really like. As for the eyeliner, it is super black and quite creamy but the second time I swatched it on my hand it broke so it's almost too soft which doesn't bode well. Thank you for reading, I hope you enjoyed this post. I am currently in the South of France so please leave me a comment sharing what you thought of this post and what your favourite L'Oreal products are that I should try next time I wander into a Boots. I would love to read your recommendations and please know that I will return all comments and read every single one as soon as I am back home with a working laptop. Please follow me on Bloglovin' if you aren't already, it means a lot. I hope you are having a lovely week. There are no affiliate links in this post, everything has been linked solely for your convenience. Check back soon for the next post. Take care. What L'Oreal products do you love? I've been testing out all 3 of their foundations and agree with you. I love the Matte & Pro Glow over the Total Cover. They always have great deals on makeup. This brand is my all time love! I need to try out the above for sure! I hope you had a nice time in France! LOL I'm the same when it comes to sales, if they had the 3 for 2 sale near me I would also convince myself I needed the extra two products ;) It's a shame that you don't like the new foundation as much as the true match. I always get all the infallible foundations confused since there are so many different ones... and I think there are also different ones in various countries? Anyways hope you're having a lovely time in France! I would like to try the Total Cover foundation, but as you said it is difficult to blend... and I prefer BB creams... but well, sometimes we buy products and have another idea, so I still would like to try it :) L'Oreal mascaras are like that, they are good, but somehow they are not really all what they promise! A very good review! Hope you have a lovely weekend! The Total Cover foundation has gotten very mixed reviews, more negative than positive if I'm totally honest and my customers have complained about it too. I love the original Volumnious mascara, it gives great volume, length and a touch curl. The packaging is very different though so I'm not sure if this is the same one.